ASSESSING OURSELVES: CONFIRMING ASSUMPTIONS AND IMPROVING STUDENT LEARNING BY EFFICIENTLY AND FEARLESSLY ASSESSING STUDENT LEARNING OUTCOMES. The American Bar Association’s (ABA) proposed accreditation standards for law schools that would require faculty to not only assess individual student performance, but also to assess themselves as legal educators to ensure they are meeting their institutions’ goals of student learning, have stirred a debate among legal educators regarding the justification for assessment and a scramble to figure out how to comply. This article contends that assessment is justified as an ABA accreditation standard given the history of questionable quality and unaccountability in post secondary education, and the increasing reliance on accreditation as a form of consumer protection.  Furthermore, cognitive psychology and learning theory support assessment as a means to improve student learning. Once legal educators understand the purpose, value and use of assessment results, and how easily it can be embedded into their courses, they will be eager to engage in the process. 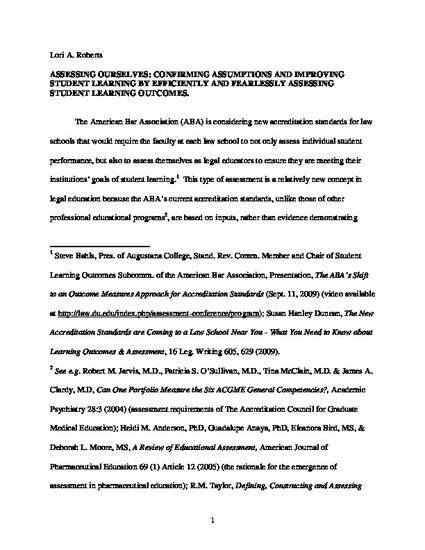 Indeed, regardless of the justification and more inspiring than external forces like the ABA’s proposed mandates, assessment in legal education is appealing to legal educators because with evidence that confirms student learning, they can celebrate their accomplishments and confidently maintain the status quo. When evidence reveals that students are not reaching acceptable levels of competence in the identified learning outcomes, educators can take the opportunity to modify a course or program, re-tool teaching methods, or alter the institution’s curriculum. In either case, decisions then are based on evidence of student learning, not individual professorial perceptions or unverified assumptions.